At Rancho San Diego Dental, we create natural-looking, well-fitting bridges to cover the gaps left by one or more missing teeth. A Dental Bridge is used to fill the gap of one or more missing teeth. Bridges can be an excellent, affordable solution to handle missing teeth without requiring the use of dental implants or partial dentures. Even if you have a missing tooth at the back of your mouth that people don’t often see, getting the gap filled is very important to your chewing function and your overall oral health. Spaces in the mouth from missing teeth can cause multiple teeth to shift, lead to bite and/or jaw problems and spur periodontal disease. A bridge is made of two supporting teeth and one or two porcelain teeth to fill the gaps. Those two supporting teeth can be dental implants or crowned natural teeth. The bridge and crowns can be all-porcelain. Or they can be porcelain fused to zirconia or metal. We use top-grade, natural-looking and durable materials. 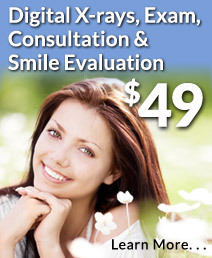 And we’ll make sure your bridge looks completely natural, that it’s correctly placed and that it’ll last a long time. Implants can be used to support a Bridge. Dental bridges safeguard the integrity of existing teeth and help maintain a healthy, vibrant smile. 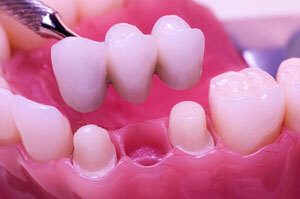 A bridge can be attached to dental implants. With an implant-supported bridge, the bridge is anchored on both sides by an implant. 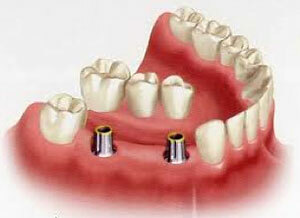 An implant-supported bridge is another option to full dental implants or dentures. Unlike dentures, bridges are permanently fixed in place and act very much like your natural teeth. If you are going to have teeth removed, or if you already have a lot of missing teeth, an alternative is a bridge supported by implants. If you have three to four missing teeth, for example, we can create a bridge by placing two dental implants and then using them to secure the bridge. It is an important part of full-mouth reconstruction. 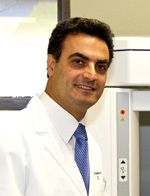 Dr. Meserkhani attended the Loma Linda University School of Dentistry and specialized in Prosthodontics and Implant dentistry. He is board-certified by the American Board of Oral Implantology. He is also Board eligible by the American College of Prosthodontics and is an Associate Fellow of the prestigious American Academy of Implant Dentistry.